William was born in Hammersmith London in 1892 and was baptised there at St Mary’s, Stamford Brook, on 15 November. He was the son of Silvanus George Luke and his wife Caroline Hannah née Carter. William was their youngest child and only son; he had four elder sisters: Caroline Emily (born 1882), Frances Ethel (1884), Edith Bessie (1885) and Dora (1890). Silvanus was a carpenter by trade and the family lived at various addresses in Hammersmith before moving to Newbury in early 1901, in time for the census, and appearing in the local Cosburn’s Directory for the first time in 1902. However, the move was not of the complete family - Silvanus remained in Hammersmith and was lodging with the Coumbes family at 44 Gratlow Road when the census was taken on the night of 31 March 1901. It appears that the marriage had broken down, and Silvanus seems to have remained in West London, dying there in 1909. Caroline, who was originally from Hungerford, settled in Newbury at 4 Alpha Cottages, Jubilee Road (now No 23) earning a living as a dressmaker. Caroline Emily found work as a school teacher at one of the council schools and Edith worked with her mother as a dressmaker. William completed his schooling and went to work for the local engineering company, Plenty & Son. He also joined the army, enlisting in the Territorial Force as a member of the Newbury Company of the 4th Battalion, Royal Berkshire Regiment. He was also a keen and capable footballer appearing for the town team on many occasions. He was evidently good company and of a cheery disposition - his mates nicknamed him ‘Happy’. When war was declared on 4 August 1914 the Territorial Force was immediately mobilised. On the afternoon of 2 August the 4th Royal Berks had arrived at their summer camp at Churn, on the downs near Didcot. Instead of 15 days on the downs they found themselves back on a train to Reading at dawn on 3 August – the army was preparing for war. Many of the men, especially those with a long trek to their home village, hung around their various drill halls and armouries anticipating the mobilisation, which was ordered on 4 August, the order arriving at Brock Barracks in Reading at 7.20pm. That night notices were delivered to every member of the battalion scattered around the county by the police and eager parties of volunteers. William’s home in Jubilee Road was a short walk from the Newbury armoury so, although he may have hung around the armoury with his mates, he would have been able to say goodbye to his mother and sisters before assembling at the station with the rest of the men on their way to the barracks at Reading. 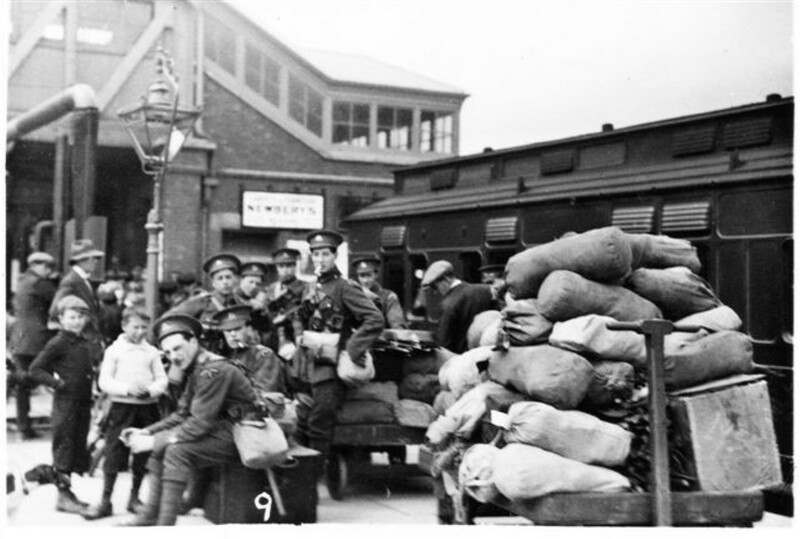 A photograph was taken of a group of the Newbury Company, including William, at the station that day. William and his mates waiting at Newbury Station for the train to Reading (5 August 1914). After a day in Reading taking a medical and collecting kit, the battalion entrained for Swindon where the South Midland Division was assembling. The Territorial Force was an arm of the British Army that was committed to home service in defence of the country; the army could not send them overseas if they did not want to go, so the men were asked to volunteer for overseas service; those who did signed the Imperial Service Obligation and became the core of the 1st/4th Battalion; those who didn’t became the basis of the 2nd/4th Battalion. From Swindon the1/4th Battalion travelled to Chelmsford (the last 70 miles by foot) where the division remained through the autumn and winter. In peacetime the battalion comprised eight companies drawn from different localities around the county; this was reorganised to conform to the Regular Army pattern of four companies (referred to as double companies in the battalion history); the Newbury Company, formerly E Company, joined with men from Wallingford and Wantage becoming part of B Company. However, before this amalgamation occurred E Company gathered together for their Christmas Dinner – a full list of attendees being printed on the menu. Minister of War, Lord Kitchener, had no confidence in the Territorial Divisions and was reluctant to send them to France; even when men were desperately needed he only sent a few battalions of the London Rifles. However, in March the German’s assault on the Ypres salient (2nd Battle of Ypres) exposed the insufficiency of troops in France and Kitchener was forced to commit the Territorial Force en masse. The 2nd Midland Division, by now renamed the 48th (2nd Midland) Division, crossed the channel in the last days of March. William was not on the list of attendees for Christmas dinner, nor was he on the boat with the battalion on 30 March, so it is possible that at that stage he had not volunteered to serve overseas and was with the 2/4th Battalion at the time. However, this is just one of many possible explanations; he certainly had volunteered by the time he did cross to France on 25 June 1915 - long before the 2/4th Battalion went to war. The 1/4th Battalion did not take part in any of the major actions of 1915, spending its time in the daily grind of life as a frontline unit on the Western Front. A battalion would expect to spend a few days manning the firing line, a few days in support or reserve trenches, a week or so in training/rest billets, and plenty of digging (trenches were always being dug/repaired/improved), and then back to the trenches as the cycle began again. On 2 May 1916 William died of wounds at one of the many Base Hospitals at the seaside town of Etaples, south of Boulogne. It is not known when he was wounded, but the most likely occasion was during the 1/4th Battalion’s stint in the line at Hebuterne from 20-25 April. Enemy bombardments on 22 and 24 April resulted in small numbers of casualties; perhaps William was among them? LUKE – Died from wounds, May 2nd in France, Pte William Shadwell Luke, 4th Royal Berks, only son of Mrs Luke, Jubilee Road, aged 24 years. Intelligence has been received of the death of Pte William Shadwell Luke, only son of Mrs Luke, of Jubilee Road, Newbury, as the result of wounds received in action. The deceased, who was a member of the “E” (Newbury) Company of the 4th Royal Berks Regiment, was well known among the young life of the town, being of genial disposition, which earned him the sobriquet of “Happy”. He was an enthusiastic footballer, and had played for the town club in many of their important matches, besides doing duty with junior clubs in the town. 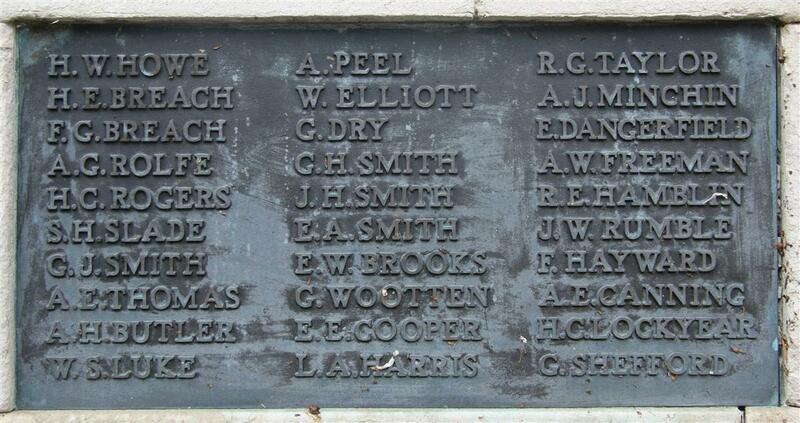 Previous to going on service with his regiment, he was employed at the Eagle Ironworks. He was buried in grave V.B.23 at the huge cemetery at Etaples, the cemetery is, reputedly, the largest in France with 10,816 identified casualties (St Sever cemetery and extension in Rouen between them have 11,727 such casualties in a contiguous space). Back home he is remembered on tablet 10 of the Newbury Town War Memorial, he was also remembered on the roll of honour at his parish church. Sadly this church, St John’s, was destroyed by enemy bombing in WW2 and the roll of honour was lost. His name is also remembered on the rear of a large headstone in Newtown Road Cemetery. The stone commemorates the burials of William and Caroline Shadwell – obviously relatives of William though, to date, the exact relationship is unknown.